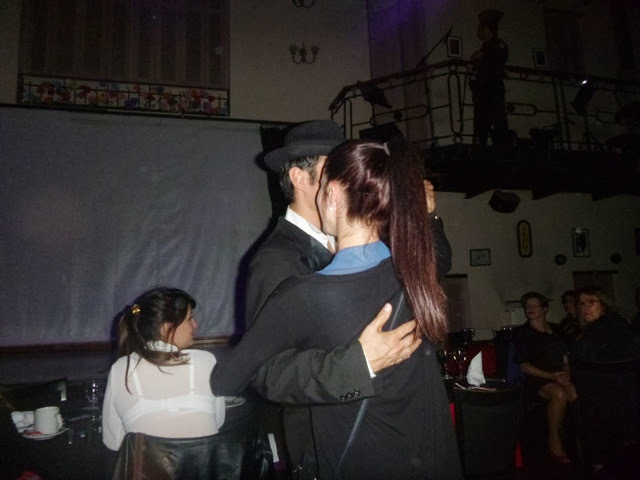 Tango is a very big part of Argentinian culture, especially in Buenos Airies. There are people dancing tango on the streets and countless tango shows all over the city ranging from ones aimed at tourists and ones that the locals go to. We booked a show through our awesome hostel, American del sur. 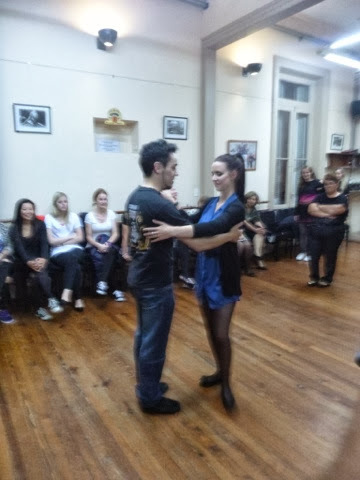 It included transfers, a free tango lesson, a tango show and a delicious three course meal all for $70 Australian dollars, don’t you just love this country!? We got a mini bus to the theatre called Tango Complejo and waited patiently for our dance teacher to arrive. There were lots of us in the room including a few Aussies, a kiwi, twoNorwegian girls, some English people and lots of older Brazilian people who turned out to be teachers on vacation, they were hilarious! The dance teacher was one of the dancers in the show we were about to see. He was really funny and an excellent teacher. We only learnt a few steps but it was a great laugh. He kept making us change partners which kept it nice and social. 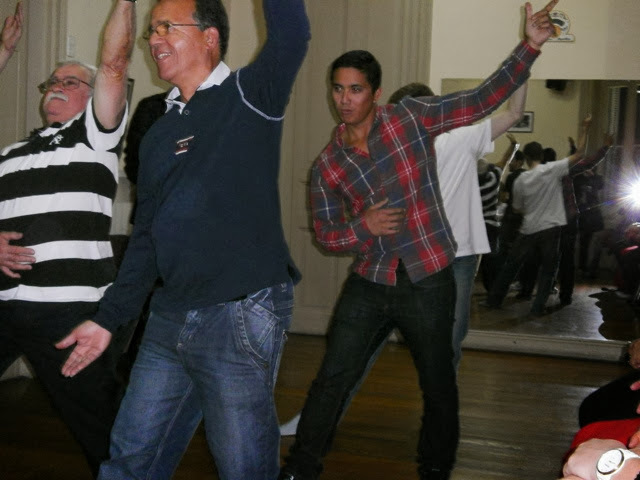 I’m sure the old men loved dancing with the young girls. I feel like Tango really reflects the culture between men and women in Argentina. At one point the teacher called me up to come demonstrate. I went to move to do the steps and he jokingly told me off. He told me that the man was in charge and I can only move when he tells me to, the men always lead the way and give the directions to the women. After our hilarious lesson we headed into the theatre for our three course meal. The waitress came around and asked what wine we would like, white or red. I was just expecting a glass, to my enjoyment she brought us a bottle each!!! This night just kept getting better and better. 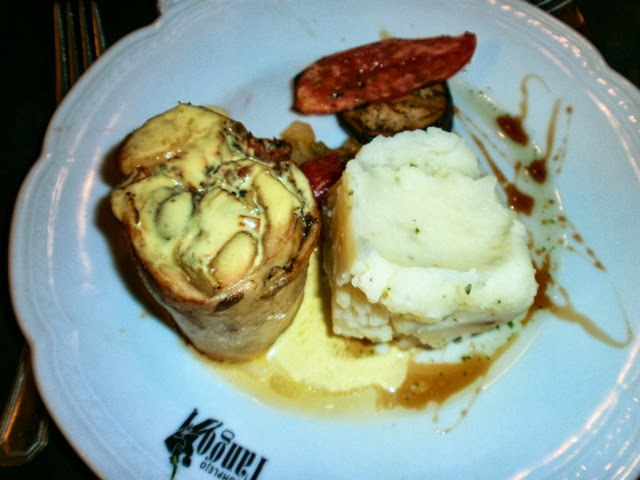 The food was delicious which started with a nice salad, stuffed chicken with mash potatoe and veggies for mains and brownie and ice cream for desert. I was extremely full to say the least. The show was excellent, filled with plenty of spins, high kicks, glitter, costume changes and lots of acting. The girls pulled Tom up on stage to dance three times, one time he was even still chewing his dinner haha bless him! It was hilarious. At the end of the show they came into the crowd and pulled up some people to dance with. One of the guys got me to dance, luckily not on stage! The lesson was hilarious, the food was delicious and the show was spectacular. The old Brazilian people just made the whole experience so much better. They were so friendly and so funny! Even though we didn’t speak the same language we managed to have a lot of laughs together. It was one of my favourite nights of our whole trip 🙂 I highly recommend it to anyone coming to Buenos Airies.